The US military’s aggressive Asia-Pacific strategy is escalating tensions with China and prompting local resistance throughout the region. 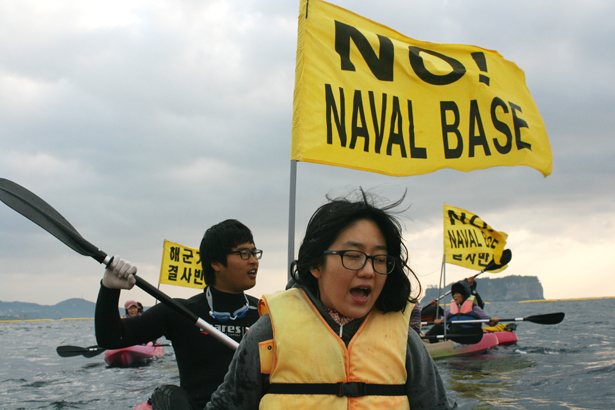 On the small, spectacular island of Jeju, off the southern tip of Korea, indigenous villagers have been putting their bodies in the way of construction of a joint South Korean–US naval base that would be an environmental, cultural and political disaster. If completed, the base would hold more than 7,000 navy personnel, plus twenty warships including US aircraft carriers, nuclear submarines and destroyers carrying the latest Aegis missiles—all aimed at China, only 300 miles away. Jeju is just one island in a growing constellation of geostrategic points that are being militarized as part of President Obama’s “Pacific Pivot,” a major initiative announced late in 2011 to counter a rising China. According to separate statements by Secretary of State Hillary Clinton and Defense Secretary Leon Panetta, 60 percent of US military resources are swiftly shifting from Europe and the Middle East to the Asia-Pacific region. (The United States already has 219 bases on foreign soil in the Asia-Pacific; by comparison, China has none.) The Jeju base would augment the Aegis-equipped systems in South Korea, Japan, the Philippines, Singapore, Vietnam and the US colony of Guam. The Pentagon has also positioned Patriot PAC-3 missile defense systems in Taiwan, Japan (where the United States has some ninety installations, plus about 47,000 troops on Okinawa) and in South Korea (which hosts more than 100 US facilities). The United States has also begun rotating troops to Australia and has announced plans to build a drone base on Australia’s remote Cocos Islands. (Also targeted is the gorgeous Palawan Island in the Philippines and the resource-rich Northern Mariana Islands, to name only a few on a long list.) In a whistle-stop tour of the region intended to shore up more allies last September, Panetta said the United States hopes to station troops in New Zealand as well, though approval for that has not been granted. Obama made his own tour just after re-election, courting Myanmar, Cambodia and Thailand as potential trade partners and military allies in the encirclement of China. The United States has even reopened discussions with the brutal Indonesian military—collaboration had been suspended for several years because of human rights issues—in an attempt to influence this key trading partner with China. Adm. Robert Willard, head of the US Pacific Command (PACOM), gave context to these maneuverings in September 2011. In a speech at the World Affairs Council in San Francisco, he labeled the entire Asia-Pacific region—which contains 52 percent of the earth and two-thirds of the human population—as a “commons” to be “protected” by the United States. Normally, the word “commons” refers to resources commonly shared and controlled by contiguous parties. But Willard seemed to have in mind a massive “US commons” that extends nearly 8,000 miles from the Indian Ocean to the west coast of North America. Willard’s imperial rhetoric recently became concrete when PACOM reacted to disputes between Japan and China over islands in the geostrategically vital East China Sea. From its Pearl Harbor headquarters in Hawaii, Willard initiated joint military exercises involving 37,000 Japanese and 10,000 American troops. And last October, PACOM sent a Navy aircraft carrier strike group to Manila to show force in the Philippines’ dispute with China over the Spratly Islands. On the island of Jeju, the consequences of the Pacific Pivot are cataclysmic. The UNESCO Biosphere Reserve, adjacent to the proposed military port, would be traversed by aircraft carriers and contaminated by other military ships. 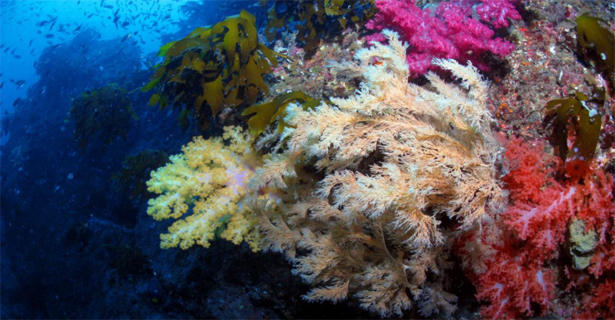 Base activity would wipe out one of the most spectacular remaining soft-coral forests in the world. It would kill Korea’s last pod of Indo-Pacific bottlenose dolphins and contaminate some of the purest, most abundant spring water on the planet. It would also destroy the habitats of thousands of species of plants and animals—many of which, such as the narrow-mouthed frog and the red-footed crab, are gravely endangered already. Indigenous, sustainable livelihoods—including oyster diving and local farming methods that have thrived for thousands of years—would cease to exist, and many fear that traditional village life would be sacrificed to bars, restaurants and brothels for military personnel. Gangjeong villagers also worry that twentieth-century history will repeat itself, turning their small village into a first-strike military target, as had happened there during World War II and the Korean War. The base protesters want never again to get caught in the cross-fire of global powers. The villagers’ struggle has been difficult. Dissidents in South Korea are quickly labeled “pro–North Korean,” blacklisted and often imprisoned. In Gangjeong, they’ve faced continual police violence but have continued to battle daily for five years. They do this despite the fact that most of their efforts have gone unreported by the highly controlled Korean press and an oblivious US media—at least, until this past September. A miraculous break presented itself when the International Union for Conservation of Nature (IUCN)—the world’s largest mainstream environmental group, which claims dedication to “a just world that values and conserves nature”—announced it would hold its quadrennial World Conservation Congress for 8,000 participants on Jeju September 6–15, only four miles up the road from the destruction and increasingly bloody confrontations. Some of the remaining endangered soft corals threatened by military-base development off the Gangjeong coast, Jeju Island, Korea. The villagers rejoiced at the prospect of reporting their story to this gathering of world environmental leaders. However, they were soon shocked to find out that IUCN leaders planned to ignore the nearby catastrophe. What happened? It turned out that a horrendous deal had been struck, unbeknownst to NGO-member organizations, between IUCN’s top leaders and the South Korean government. The government had budgeted $21 million to support the convention. In return, the IUCN had agreed it would not allow discussion of the naval base during the convention without government approval, nor would it permit any of the villagers to participate in, or even get near, the proceedings. Additional financial support came from several giant corporations, including Samsung, the lead contractor in the base construction. It was only when an internal revolt erupted from within IUCN’s membership that the dubious deal was challenged and the struggle against the military base catapulted onto the international stage. Apparently, greenwashing the navy base was not the only reason the Korean government had paid so dearly to host the 2012 Congress in Jeju. It also wanted to promote a long list of what it calls “Green Growth” projects to a skeptical Korean public. The term is a grievous misnomer. These hugely profitable, environmentally devastating initiatives are driven by Korea’s chaebol—family-run monopolies such as Samsung, Hyundai and LG, which have interests in construction, defense and electronics, among other things. Recent Green Growth projects have included the manufacture, promotion and export of “clean nuclear energy.” The most notorious of the Green Growth boondoggles was the Four Major Rivers Restoration Project, which was not a restoration project at all. It involved the construction of concrete channels to straighten Korea’s beloved winding rivers for commercial shipping. The project displaced farmers, caused floods, contaminated drinking water and slashed populations of migratory birds, and it continues to wreak havoc on the collective psyche of people in the area. At the 2012 Ramsar Convention, the World Wetlands Network named it one of the five worst wetlands projects in the world. 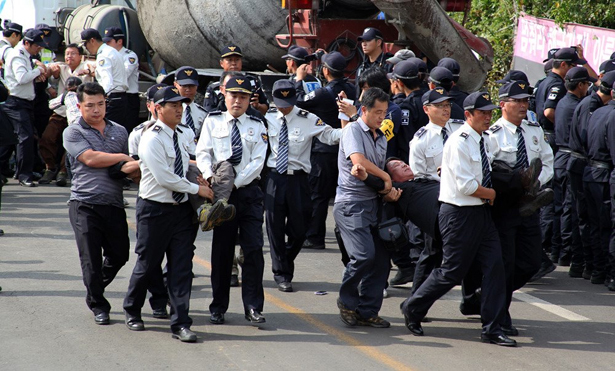 After this debacle and in the face of the growing navy-base controversy, the Korean power elite needed the 2012 IUCN Congress in Jeju as a PR boost to appease heartsick citizens. It didn’t work out that way. Once they figured out what was going on, IUCN’s members were appalled. They were astonished that the Secretariat had so drastically compromised its values by partnering with the Republic of Korea. They should not have been surprised, though. Four years earlier, in Barcelona, IUCN members had decried a partnership between IUCN leadership and Shell Oil. And this year’s plenary panels were equally revealing: although the Gangjeong villagers were refused entry, Shell President Marvin Odum was invited to speak as an authority on climate change. On another panel, the CEO of GMO-breeder Syngenta, spoke on sustainable agriculture. Many disgusted IUCN members quickly joined in solidarity with the Jeju Emergency Action Committee, a group of anti-base/pro-Gangjeong activists that featured supporters like Vandana Shiva, Robert Redford, Gloria Steinem, Victoria Tauli-Corpuz, Noam Chomsky, Joseph Gerson, Christine Ahn and dozens of prominent scientists and environmentalists. During the convention, the committee sent a series of fiery protest emails to the membership, while promoting meetings and interaction with the villagers. The turning point came when People’s Solidarity for Participatory Democracy, a Seoul-based NGO, disseminated a just-acquired report from the Ministry of Defense that had been submitted to the National Assembly. The report indicated that ships would regularly pass through the core of the UNESCO Biosphere Reserve, dooming all life in that area. Capt. Yoon Seok-Han, chief of base construction, promised during a press conference that no ships would travel through the core except in the case of bad weather (which is common in that area). IUCN members began to loudly denounce the Secretariat’s “deal with the devil.” The Secretariat backpedaled furiously to mitigate the rift that was rapidly materializing within its ranks. Suddenly, the organization encouraged anti-base presentations and allowed pamphleteering inside the convention center. The Gangjeong villagers found themselves the star attraction of the conference. They seized the moment and sold yellow T-shirts, and even held a concert that drew hundreds of spectators. Young villagers dressed as endangered species sprawled on the floor in tortured positions and held signs that said, “Please let me live!” The Korean sponsors were horrified. By Day Five of the conference, government officials were watching their exorbitant PR investment blow up in their faces. A Chicago-based NGO, the Center for Humans and Nature, introduced a surprise emergency motion to halt the navy-base construction. Within forty-eight hours, a record thirty-four other NGOs had signed on as co-sponsors. 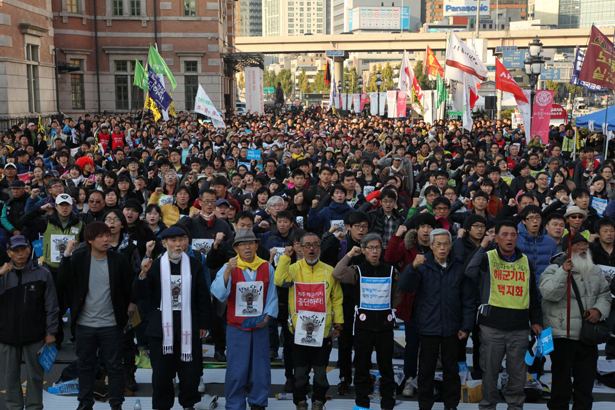 Immediately following the convention, hundreds of villagers, joined by Buddhist and Christian leaders, led a one-month march to Seoul, picking up local supporters en route. When they arrived at the capital for a giant rally (which went unreported by the Korean media), the protesters were 5,000 strong. But back home on Jeju, the government had ramped up base construction to go 24/7, forcing villagers to extend their protest vigil at the construction gate around the clock, through cold, rainy nights and continual police attacks. Thus, the Gangjeong villagers’ life-or-death battle continues. One key upcoming date is the Korean presidential election. Activists hope that if center-left candidate Moon Jae-in is elected over right-winger Park Geun-hye on December 19, the base situation will be reassessed. As the Pacific Pivot advances across the region, local resistance movements like Jeju’s are also rapidly growing. Communities are increasingly refusing to be sacrificed by their governments as tribute to a superpower benefactor. For example, in Okinawa, 100,000 protesters have repeatedly taken to the streets, fed up after decades of “bearing Japan’s burden” of the US military presence, including rapes and violence on local citizens. Now, the people are protesting deployment of loud and menacing Osprey hybrid aircraft, which fly low over neighborhoods and are famous for crashing. In the Philippines, protests are building against the increasing US military presence, particularly over toxic dumping. Similar resistance is developing among smaller Pacific island nations—especially from indigenous populations in Melanesia, and in the Marshall Islands, where US missile tests are proceeding. (Marshall Islanders feel that the US nuclear bombing of Bikini and other atolls in the 1940s and ’50s sacrificed enough.) The latest blowback comes from the far-southerly, pastoral Japanese island of Yonaguni, only sixty-nine miles from Taiwan. The United States is pressuring Japan to build a China-threatening base there, but local resistance is mounting. 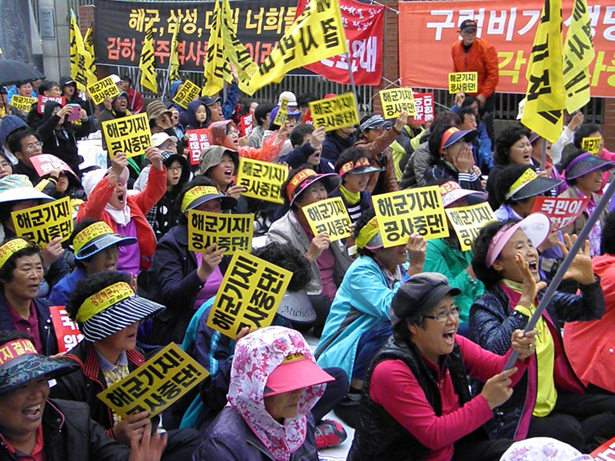 Anti-base protest by Gangjeong women farmers. Now something really new has developed: the heretofore disparate peoples of the Asia-Pacific are unifying into larger coalitions for mutual aid and action. Fourteen months ago, when nineteen heads of state (including Obama) gathered in Honolulu for the Asia-Pacific Economic Cooperation meetings and the Trans-Pacific Partnership (TPP) trade negotiations, an unprecedented parallel event was also under way across town at the University of Hawaii. Some 300 anti-militarism, anti-globalization, and environmental and indigenous-rights activists from across the region met for the first Moana Nui (Polynesian for “Big Ocean”) gathering. They collaborated for three days of private planning, coalition building and public meetings, concluding with a spirited march through Waikiki, and a large protest demonstration outside the TPP negotiations. It was widely reported in the Pacific, but not on the US mainland. The second Moana Nui is being organized for San Francisco next spring. Its first goal will be to awaken mainland Americans to all that’s at stake in the Pacific. The question, finally, is this: At a time of economic and ecological crisis, do Americans really want to ramp up costly and dangerous Cold War programs in hundreds of places, thousands of miles away, nearly always against the popular will of those who live there and with awful environmental effects? If not, then now’s the time for wide debate on the Pacific Pivot and all its ramifications. Koohan Paik and Jerry ManderKoohan Paik is the campaign director of the International Forum on Globalization’s Asia-Pacific program. Jerry Mander is IFG’s founder and distinguished fellow.